Julius, Frederick Gilder. b. 28 Feb 1811, 4th s of Dr George Charles Julius of Richmond, Surrey. Day Boy, Jan 1823 - Sep 1826. M.R.C.S. and L.S.A. 1833; M.D. (Lambeth) 1851; F.R.C.S. 1853: practised at Richmond. m. (1) 1839 (sic) Ellen Hannah o.d. of William Smith of Nottingham; (2) 1871 Sarah Hannah, widow of Hon. Judge Charles James Hargrave, Judge of Landed Estates Courts, Ireland. d. Richmond 4 Jan 1886. Frederick went to Charterhouse School with his brothers. He took his Medical Degree in Edinburgh. Dr Frederick's career was equally as distinguished as his father's before him and he too was under the patronage of the Royal Family. He was a Medical Officer of the Royal Hospital, the opening of which was chiefly due to him. Originally known as the Richmond Infirmary , it enjoyed the patronage of Queen Victoria and by her command  was hence-forth known as the "Royal Hospital". After his retirement Dr Frederick usually spent the winter months travelling in the Mediterranean region, visiting on different occasions the Azores, Spain, Italy, Corsica, Algiers, Egypt, Palestine and Constantinople. Finally he 'fixed his abode upon Richmond Green', where he died from inflammation of the lungs, in his 75th year, after a very few days illness. He was buried in the Richmond Cemetery, thus ending a family association with that village which had lasted three quarters of a century. Julius Jottings, January 1901. No 4. He practiced for a few years at Bognor, where his eldest sister, Emily, kept house for him. He then fell to bad health, and had to travel abroad. On his return he went into partnership with his father Dr George C Julius snr. (note he was apprenticed as an Apothecary in 1827) He lived most of his life in the Old Palace, Richmond, but retired from practice when about 60 years and travelled extensively. He was a fine looking man, about 5' 11 ", with fair complexion, blue eyes and a long white beard. He was very witty, clever, and amusing; very sarcastic and alarming to those who did not know him very well; but very kind and gentle in sickness. Two of his daughters, Anne Ellen and Katherine Pauline married doctors. Dr. William Bateman and Dr. Edward Fenn respectively. These two doctors carried on their father-in- laws practice in Richmond until 1912, when the practice, which had been in the hands of the JULIUS FAMILY since it was first established by Dr. George Charles Julius in 1814, 98 years before, passed into other hands. Richmond Census 1841: Frederick Julius, 30yrs, Surgeon. Ellen Julius, 27 yrs. Frederick and his father appear to have had a close association with Arthur George Onslow the 3rd Lord Onslow (1777 - 1870). Onslow had no surviving heir, it is clear Frederick's youngest son was named after Onslow, who was his godfather. It is unclear what the note below refers to. This note relates to a French snuff box left to Frederick presumably at Onslow's death. "I leave the snuffbox to my good and excellent friend Mr Frederick Julius; in token of my high regard for him, and under the full appreciation of those truly Christian qualities which so are not ostentatiously adorned his private character"
An apprentice to George Charles Julius of Richmond Surrey Apothecary for 5 years. Indenture dated 6th Feb 1827. June 13 1833 Mr. Frederick Gilder Julius of full age candidate for certificate to practice apothecary. 2 courses on Materia Medica and Botany ? 2 courses on Principles and Practice of Medicine ? Examined by Mr Bacot and approved. M.D. University of Edinburgh 1825. Member Royal College Surgeons England 1826. M.D. by Doctorate granted by Archbishop of Canterbury 1851. Registered 1 Jan. 1859. Julius Frederick Gilder Richmond Surrey surgeon. Member 1833, Fellow 1853, Royal College Surgeons England. Registered 17 June 1859 Julius George Charles Horwood Bideford Devon. NOTES ON FREDERICK'S EDUCATION AND WORK. NOTABLE BRITISH TRIALS - Dr Thomas Smethurst 1859 - L.A.Parry. Penguin Books Famous Trials, edited by James H. Hodge - Dr Thomas Smethurst 1859 by L.A. Parry. Miss Bankes was until her marriage [to Dr Thomas Smethurst] in reasonably good health, though subject to bilious attacks. Soon after, she was taken ill and for the first few days her husband attended her. As she got no better it was decided to call in another doctor, and on the advice of the landlady, Dr Julius a well known I Richmond practitioner, was sent for. He first attended on 3rd April. When he was told by Smethurst that his wife was suffering from violent diarrhoea and vomiting -------- As the drugs tried led to no improvement, Dr Julius began to suspect that some irritant poison was being given to her. He asked his partner, Dr Bird, to see Miss Banks------- lie came to the same conclusion as his partner, but only after Dr Julius had mentioned his own fear to him. 2nd Trial 15 August 1859. Dr Julius gave evidence about Miss Bankes's illness and her treatment. He was cross - examined by Mr Sergeant Parry, for the defence. Mr Sergeant Parry: Are you a Doctor of Medicine? Mr. Parry: Is yours a London Degree? Mr Parry: What Degree is it? Dr Julius: It is the Archbishop of Canterbury's degree. Mr Parry: What ! Can he make a doctor of medicine. The Lord Chief Baron: Yes; and he can also make a Master of Arts. Mr Parry:Did you take your degree as a matter of course? Mr Julius:Oh, dear, no ! It is a very uncommon thing. I had to get a certificate from 2 members of the College of Physicians, Stating that they had known me for a length of time, and that I was a proper person to have a degree? Mr Parry: And having that certificate you got your degree? Mr Julius: Yes; but it only entitles me to call myself "doctor"
The Lord Chief Baron: But you are a member of the College of Surgeons, and a member of the Society of Apothecaries? Note by the Editor, L.A. Parry. This power to grant medical degrees was a remnant of Papal authority, which was reserved to the Archbishop of Canterbury by a statute passed in 1533 in the reign of Henry VIII. The Medical Act 1857 abolished any qualifications to practice with these degrees unless they were granted prior to the passing of the Act. Evidence given by Master Julius. I am the son of Dr Julius. On 30 April 2 sealed bottles were given to me by Dr Bird and I took them to Mr Buzzard's in Great Marlborough. . . . . It was noted that Dr Julius had bought the case to the attention of the magistrates, after a statement had been made to the effect that Drs Julius and Bird grounded their conviction of the guilt of the person on the evidence of Dr Taylor, who found arsenic in certain evacuations of Miss Bankes. Dr Smethurst was found guilty of murdering Miss Bankes, whom he had married bigamously. He was however given a Royal Pardon as impure reagents had been used in the tests for arsenic. He was then charged with bigamy and found guilty and was sentenced to one year's hard labour. THE TIMES Wednesday - Sept. 7 1859. Pg 7 col. f.
Dr Julius and Mr Bird waited on the Home Secretary with the view of undoing their evidence against Dr Smethurst. They represented to the right hon. gentleman that they chiefly grounded their conviction of the guilt of the prisoner on the evidence of Dr Taylor relative to the finding arsenic in certain evacuations of Miss Banks. ; whereas it is now ascertained that the arsenic so discovered came from the impure reagents which were employed as tests of the presence of poison in the lady's body. We further understand that the two medical gentlemen in question are most anxious to relieve themselves, by this course, from the moral responsibility they had incurred by the criminating nature of the evidence they gave on Dr Smethurst's trail. In reply to the above, I beg to state that I was requested to attend at the office of Messrs Symes, Teesdale & Co. the solicitors for the prosecution, to answer certain questions, I believe suggested by the Home Secretary, and my answers were corroborative of the evidence I gave on trial ; and I can truly say that neither Mr Bird nor myself feel any desire to be removed from a responsibility which has unavoidably been incurred by the discharge of a most painful duty to society and to ourselves as conscientious men. And I would also add that our opinions as to the cause of Miss Banks death have not been in the slightest degree shaken". Old Palace Richmond Sept. 6. Some 2 years after his release Dr Smethurst bought an action to prove the will of the woman whom he had been convicted of poisoning and actually won it. With sincere regret, we record the death of Dr Frederick Gilder Julius, which took place on Monday last, at his residence on Richmond Green, after a very few days illness, from inflammations of the lung. The deceased gentleman, like his eldest brother and father before him, practised for many years in Richmond, with which town the name of Julius has now been closely connected for nearly three quarters of a century. Dr F.G. Julius was born at Bristol in February, 1811, immediately after the arrival of his parents from India. His father shortly afterwards joined Sir David Dundas, at that time Sergeant-Surgeon to George III., in practice at Richmond, taking up in his residence in the Old Palace in 1814, where he and his son Dr Frederick Julius after him continued to reside until the latter retired from practice in the summer of 1871. After his retirement, Dr F.G. Julius usually spent the winter months travelling in the neighbourhood of the Mediterranean, visiting upon different occasions the Azores, Spain, Italy, Corsica, Algiers, Egypt, Palestine, and Constantinople. Finally he fixed his residence upon Richmond Green again, where the first 60 years of his life had been passed, and where his career has now ended in the 75th year of his age. The funeral is to take place at the Richmond Cemetery today, at 12 o'clock. Julius, Frederick Gilder (1811-1886) M.R.C.S., April 22, 1833; F.R.C.S., June 2, 1853; M.D. Lambeth, 1851; L.S.A., 1833. Born in Bristol; his father soon afterwards removed to Richmond and joined Sir David Dundas in practice, Sir David being then Sergeant Surgeon to George III. Here he was afterwards joined by his two sons, George C. Julius and Frederick Gilder Julius. The letter received his professional training at St George's Hospital, and his Lambeth degree was granted by the Archbishop of Canterbury. "my degree is not the London degree" he said, "it is the Archbishop of Canterbury's; he has the power of granting it; I did not take it out as a matter of form, it is a very uncommon thing. In order to obtain it, I had not merely to pay the fees, I had to go to to Fellows of the Royal College of Physicians, who stated that they had known me a certain length of time, and then I was a person upon whom a doctor's degree might be conferred; upon that you are enabled to call yourself a doctor, that is all; that was my object." Julius was for many years ago a leading practitioner in Richmond, Surrey, and in 1859 was the principal medical witness in the trial known as "The Queen against Thomas Smethurst", which began on August 15 of that year and lasted several days. Dr Smethurst was accused of the murder by poison of a Miss Isabella Banks, whom he had bigamously married - he having as wife an older lady, alive at the time. Miss Banks, when suffering from severe illness, involving constant diarrhoea and vomiting, had made a will in Smethurst's favour on May 1. Julius who was called in and was in constant attendance upon her suspected that some drug of an irritant nature was being administered to her in addition to those prescribed by him. She died on May 4. His suspicions having been aroused, Julius had applied to a magistrate sometime before her death, but Smethurst was not arrested till the death occurred. Many important medical witnesses were called both for the prosecution and for the defence, and eventually Smethurst was found guilty of murder, but was reprieved owing to insufficiency of evidence, and in the end, after litigation, succeeded to Miss Banks fortune. Julius, however, had acted with entire propriety in the whole matter, as had his partner, Samuel Dougan Bird MRCS. He retired in 1871 and travelled much in countries bordering on the Mediterranean. His death occurred at Richmond on January 4, 1886. Ref: Plarr's Lives of the Fellows July Pg 640. Julius Frederick Gilder Esq. M.D. 8 Feb 1886. The Will with codicil of Frederick Gilder Julius M.D. late of 4 Portland Ter., parish of St Mary, Richmond who died 4 Jan 1886 at 4 Portland Terrace was proved 8 Feb 1886 by Arthur Onslow Julius of 15 Finsbury Circus the son, and William Adolphus Frederick Bateman of Rothsay House, Parish of St Mary Surgeon Exors at L6023 15s 2d Resworn Aug 1886 L7126 15s 5d. Awdrey Julius's notes, and notes from the family Bible of George Charles Julius put Frederick born at Bristol. Baptism date is doubtful. Mar Qtr 1839 Nottingham shown for marriage is unchecked. The above Bible is a 1723 version of the King James, printed by John Baskett. 655. 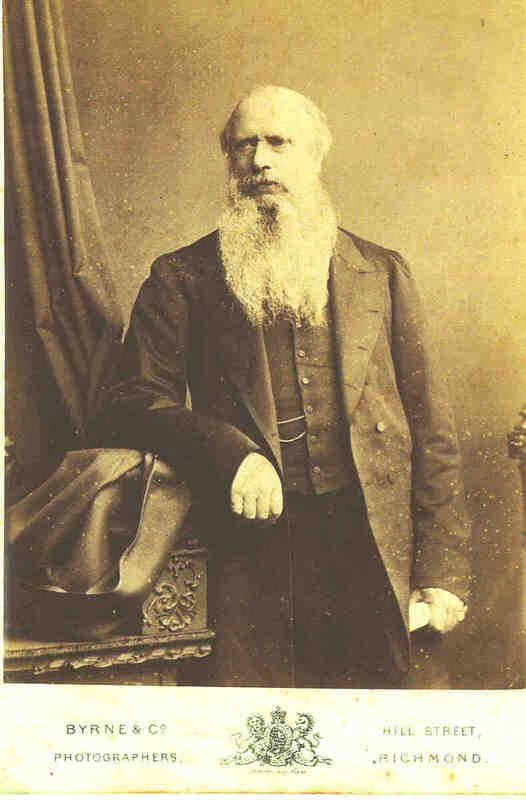 Frederick G Julius Arm. Arms: As above, but the stars Gules, and on an escutcheon, Or, a chevron cotised between three demi-griffins Sable [Smith]. Crest and Motto of Julius. The following concerns a pivotal case at law in which Frederick was somewhat of a pawn. THE TIMES - Friday March 5 1880. pg. 4 col. a. Details of an appeal to The House of Lords against a decision of the Court of Appeal on a complaint against the Bishop of Oxford concerning the practice of the Rev Thomas Thelluson Carter Rector of the Parish of Clewer. "I now reside and have for many years have resided in the Parish of Clewer Berks and am a parishioner of the said parish of St Andrew." The Oxford Movement was the cause of concern to some of the Parishioners of Clewer as it had influenced the Rev Thomas Carter and his form of worship. The Movement began in Oxford in 1833, and had reawakened spiritual and devotional life of the Church of England. However some people feared it might lead the Established Church towards Roman Catholicism. Carter had on accepting the living of Clewer in 1844, began introducing "order and decency" into the worship of the run down parish. After two petitions by some Parishioners backed by the Church Association were rejected by Carter's bishop they found a new complainant in Frederick Julius. Whilst legally a parishioner, Frederick rarely resided within the parish and did not attend the church; indeed the affidavit dated December 28th 1878, was sworn at Her Majesty's Consular Court in Cairo. The Bishop was minded to veto the application as before. But now the Church Association endeavoured to force the Bishop's hand by challenging the right of veto. Mixing water with the wine at the offertory. Standing by the Altar with his back turned to the congregation. Bowing during the Consecration and elevating the bread and wine. The outcome of the Bishop's appeal was a reversal of the Queen's Bench decision, but this was not the end. Frederick took the case to the House of Lords. Once more attention was focused not on the original charges but on the bishop's right of veto. The Lords upheld the Court of Appeal, Frederick had finally lost his case and the bishop's veto was never questioned again. The case of Julius v the Bishop of Oxford made legal history in establishing the principle that if a party has a discretion in a matter, i.e. they may act in a certain way, it does not necessarily mean they must do so. The Clewer case is cited when this point of law is at issue and has been used as recently as July 1986. Carter's daughter Jane, records in her biography of her father how Carter and Frederick met for the first time at a house on Clewer Hill. Frederick was charmed by him and expressed regret at having commenced litigation. The two men shook hands and parted as friends. In 1887 Mary Isabel Julius  Fredericks neice was admitted as a Clewer Sister where she was known as Sr Mary Isabel. She was professed in 1889 and in 1890 went to India where she served until 1894. She died on March 3rd 1898. Given by Valerie Bonham on 4th May 2001at St Andrew's Church, Clewer Village. England: Canterbury - Index to the Act Books of the Archbishops of Canterbury, 1663-1859 (A-K) Lambeth. County: General Country: England Julius, Frederick Gilder (of Richmond, Surrey, M.R.C.S. ), 1851 : Degree Doctor of Physic; 17, 73. 1. Moore's Royal Prophetic Almanack: The Book of Fate, 1840, Thought to Have Belonged To Dr Frederick G Julius. 3. Lambeth Degree Dr of Physic, 24 Jun 1851. Transcription of Grant of Doctor of Physic. I Frederick Gilder Julius the person to be admitted to the Degree of Doctor of Physic by the Most Reverend Father in God John Bird by Divine Providence Lord Archbishop of Canterbury Primate of all England and Metropolitan do sincerely promise and swear that I will be faithful and bear true allegiance to her Majesty Queen Victoria - So Help Me God. J.H.T. Manners Sutton - Registrar. Registered on the twenty-sixth day of June in the year of our Lord One Thousand Eight Hundred and Fifty One by the Clerk of her Majesty for the Faculties in Chancery. George Humphreys and Josiah Humphreys.